Temperatures did not drop below freezing last night and this morning temperatures are very warm. Because the snowpack is starting out warm and wet this morning, it won't take much heating for wet avalanches to occur. Most of these will be loose wet avalanches. Wet slides are most likely at mid and upper elevation slopes facing E, S, and W where the avalanche danger should quickly rise to CONSIDERABLE this morning. All other slopes have a MODERATE danger. Trent will update the Salt Lake City, Ogden and Provo forecasts Saturday morning (April 20th) by 7:30 am. The last scheduled forecast will be Sunday, April 21st. We will issue intermittent updates with each snowfall or significant weather event through the rest of the month. We will continue posting observations - so please continue to send those in! Closed resorts are now backcountry terrain - no avalanche mitigation is being done. Utah ski resorts are on a mix of private and public Forest Service land, and each resort has a different uphill policy - contact the individual resort for details. Temperatures have been 5-10 degrees warmer each day since Wednesday. They remained above freezing overnight. This morning temperatures are mostly in the mid 40s F following yesterday's high temperatures in the 50s. 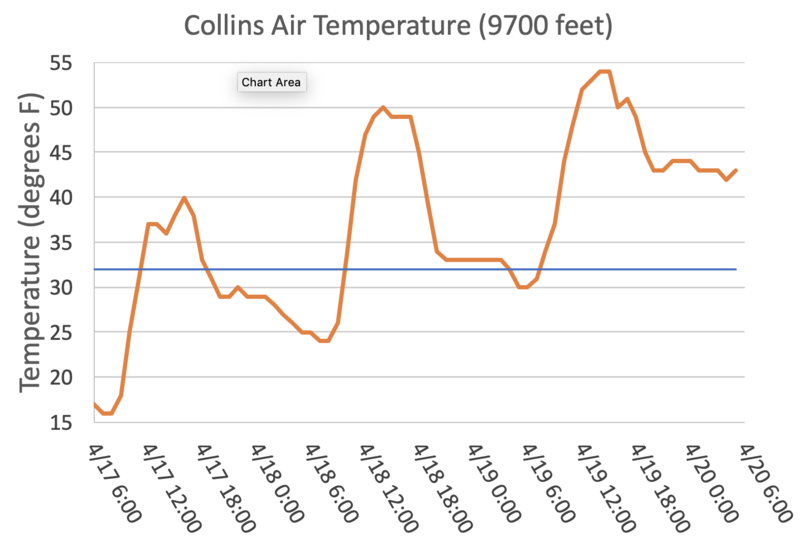 Even at 11,000 feet it's 39 degrees F. The graph below shows air temps (orange line) at the Alta Collins weather station. For reference the blue line shows 32 degrees. After yesterday's high temperatures, notice that temps last night did not cool very much and did not drop below freezing. Wind have increased from the SW this morning. They are averaging 10-20 mph and gusting 30 mph at ridgetops. At the highest peaks they are averaging 30 mph gusting to 50 mph. Today's weather will have more warm temperatures with highs similar to yesterday. Trailhead temperatures should reach 60 degrees F and upper elevation ridgelines should reach the upper 40s or low 50s F. Strong SW winds will continue and bring some clouds followed by a chance of precipitation late tonight with a rain/snow line near 9,000 feet. There were many loose wet avalanches on Thursday and some yesterday. The photo below shows some of these slides in Red Pine Gulch on Thursday (photo M. White). Also yesterday a cornice broke under a skier looking into the Wolverine Cirque. They were supposedly ok, but must have had quite a scare. Air temperatures did not drop below freezing anywhere last night. Air temperatures have been 5-10 degrees warmer than the previous morning for the last three days. On many slopes the snowpack is building it's "plumbing" system. This means drainage channels are being established. Once this happens, the snowpack can get very warm and drain a lot of water without becoming unstable. This process has already happened on some low elevation slopes that received rain during the last few storms. For now however, wet avalanches are likely as soon as the snow starts to heat up. This process won't take long because the snow did not refreeze last night. Mostly I expect loose wet avalanches. but given the dramatic warm-up a few wet slabs are possible even though we haven't seen any happen. Wet slabs are often triggered by a smaller loose wet slide. 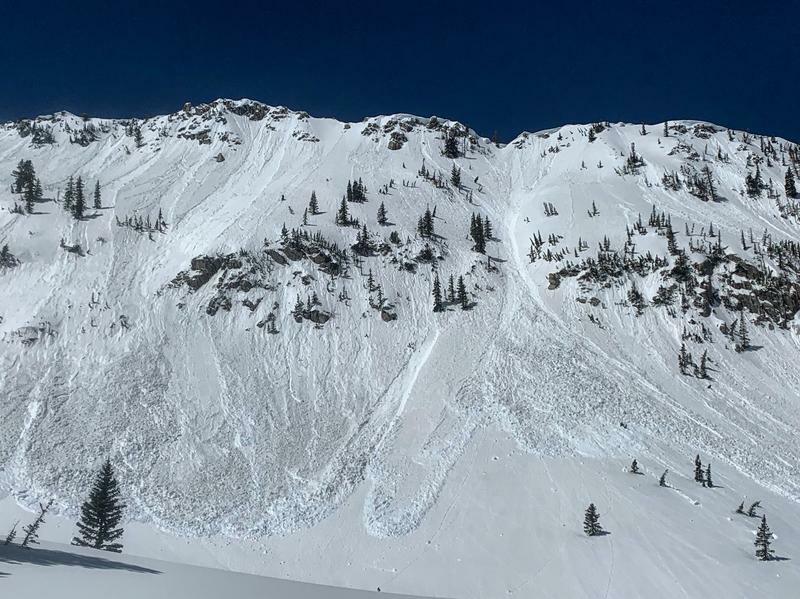 The only places that may escape having any wet avalanches are the highest elevation northerly facing slopes. Even on those slopes, I doubt the snow has stayed dry with strong south winds acting like a hair dryer this morning. Also, avoid being under any slope with a large glide crack. These are large cracks where the snow rest on a smooth ground surface and begins creeping/sliding downhill. At seemingly random times, these slopes can produce glide avalanches. Look for these large obvious cracks and just avoid hanging out beneath them.